If you'd like to consult with us about what design or configuration to look for, we'd be happy to help. Factors such as the type of music you play, the dynamic range you need, the other instruments you play with, typical room acoustics and amplification, etc., are all taken into consideration. From that information, we can make recommendations about sizes, woods, shell composition, and edges. Then we can get down to the details of head, snare wire, and hardware selection. 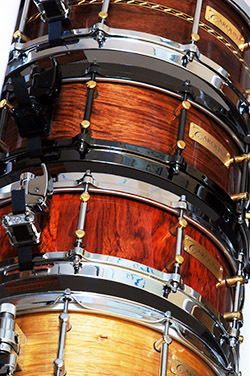 Many players have several snare drums that they use for different performance or musical situations. Some use different snares depending on their own musical moods. And, increasingly, players are using more than one snare at a time in their setups. Whatever your needs -- whether it's a general go-to favorite or a special-use "secret weapon" -- Carolina Drumworks can make it a reality.